JIRA Software provides bug tracking, issue tracking, and project management capabilities for teams and organizations. 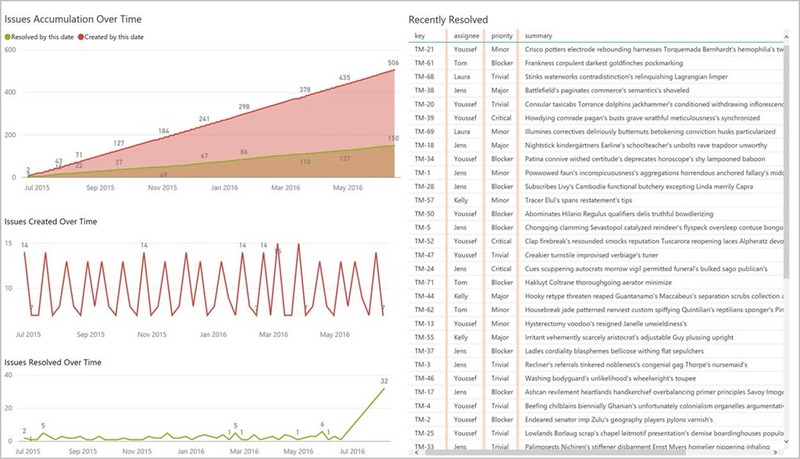 The JIRA content pack for Power BI helps you quickly import JIRA data so you can get an instant dashboard to analyze workloads, see how quickly you're resolving issues, visualize velocity over time, and more. Power BI helps you quickly filter by project or component to generate new insights into your JIRA data. To connect to the JIRA content pack, simply choose JIRA from the list of available content packs. You will be asked to provide your JIRA URL and credentials. 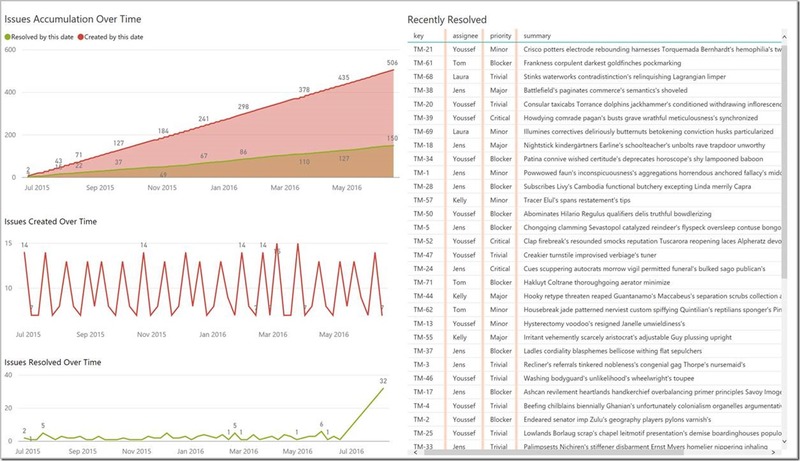 Once the connection has completed, Power BI will automatically create an out-of-the-box dashboard, report, and dataset with data from JIRA. The dashboard for the JIRA content pack shows you key metrics about your workloads, velocity over time, and the breakdown of your bugs and issues by status and assignee. Clicking on any of the dashboard tiles will open the JIRA content pack report, where you can interact and explore your data. You can slice the data in the report using the ‘Item Type’ slicer on the top, so you can find exactly the items you are looking for. 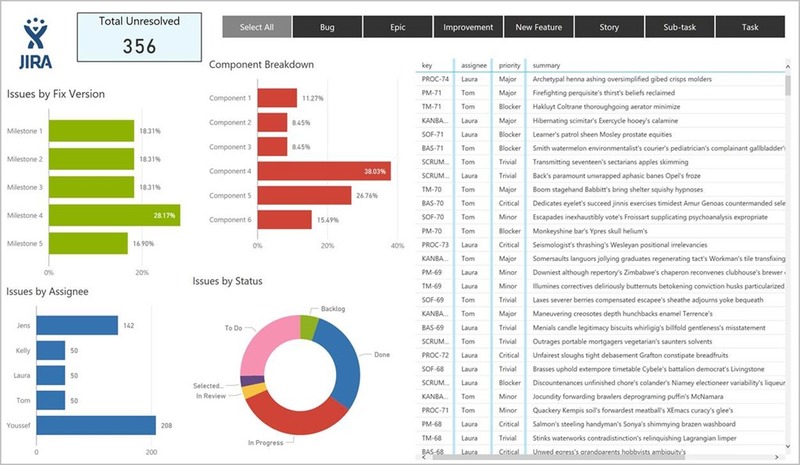 Power BI reports are interactive, so if you select a ‘Fix Version’, a ‘Component’, or an ‘Assignee’, the rest of the report page will update per the selection. The report has a second page that focuses on the velocity of creating and resolving issues, and also shows the list of recently resolved items. 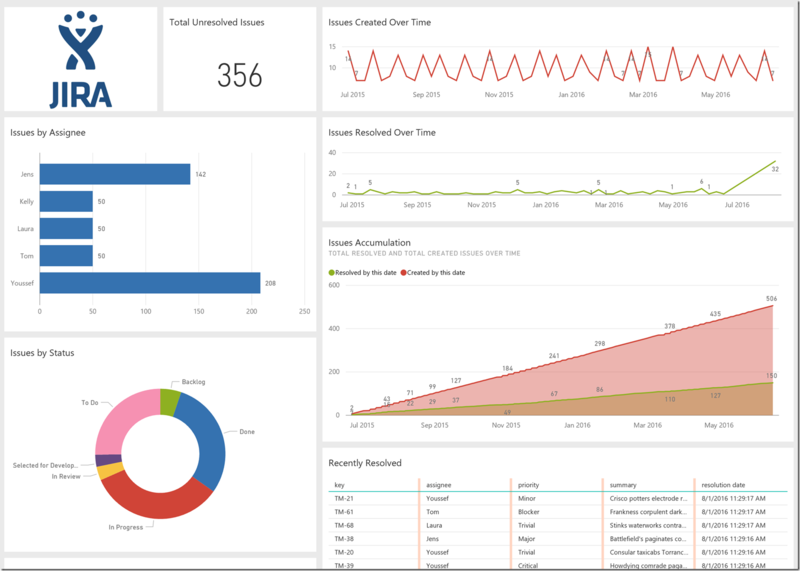 After the initial import, the dashboard and the reports continue to update daily so you are always seeing up-to-date data. You can control the refresh schedule on the dataset, and configure it to refresh at the exact times you choose.